When Congress declared war against Germany in the spring of 1917, the United States military was poorly prepared to train and arm volunteers and draftees. The regular army was small and did not have enough places to train the large number of Americans needed to fight in France. Although most United States soldiers received at least six months of training, some troops were shipped to France with only one week of military experience. Despite an all-out effort, it was 1918 before enough American soldiers arrived overseas to end the war. The trench warfare of World War I was much like what North Carolina Confederates had experienced at Petersburg, Virginia, near the end of the Civil War (1861–1865). But technology of the early 1900s had greatly changed the weapons soldiers used. Without enough weapons of their own, United States troops often trained and fought using French and British rifles, machine guns, and artillery. British and French instructors taught American troops to use the bayonet, trench knife, and hand grenade in close combat. Doughboys also learned how to dig and repair trenches, how to listen for incoming artillery shells, how to protect themselves from poison gas, and how to string and cut through barbed wire. My first 24 hours on the Western Front. Arrived about 11 o’clock p.m. muddy and tired. It was raining and had been so for many days. Mud was nearly knee deep. We finally found our dugout after walking miles it seemed [with] full pack, so slipping and sliding we went in the dugout. It had mud all over the floor and a big pool of water under the boards. After unpacking we went to bed or rather got on a bunk. Well, when the candle went out and all was still we got introduced to the trench rats and oh what a welcome they gave us. Never will I forget it or them. By the time Americans arrived on the front, the use of poison chlorine gas was common. Soldiers on watch had to alert their comrades when gas was detected. A hanging artillery shell casing often served as a warning bell, but they also used special wooden rattles to signal the presence of gas. American soldiers wore protective masks modeled after those used by the British. These were always uncomfortable and sometimes did not work if they were used the wrong way. We were supposed to have a solid front to move forward at the same time, but it didn't last. . . . The air was filled with smoke, and dust, and fog to where you didn't have much chance to keep your sense of direction. I think that partially accounts for the disorder we had within the ranks. A few of us could stay together, but if we got maybe forty feet away from the other men we couldn’t see them. Once in enemy trenches, fighting became little more than a deadly brawl with soldiers using rifles, pistols, bayonets, trench knives, clubs, and shovels to kill each other. At the time of this article’s publication, Tom Belton served as curator of militaria, politics, and society for the North Carolina Museum of History. Belton previously served as executive secretary of the Tar Heel Junior Historian Association. US Army, Signal Corps. 1918. 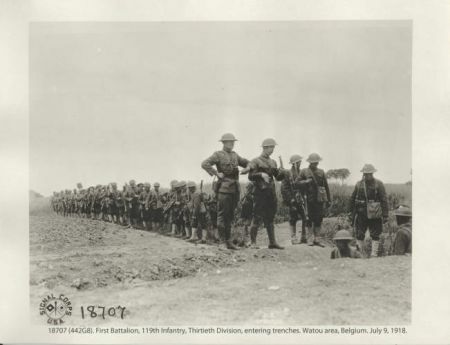 "First Battalion, 119th Infantry, Thirtieth Division, entering trenches. Watou area, Belgium, July 9, 1918." State Archives of North Carolina. Online at http://digital.ncdcr.gov/u?/p15012coll10,1550. Accessed 08/31/2012.